Pick up at your hotel in Yogyakarta about 08.00 and then drive about 3 hours to Wonosobo Area. 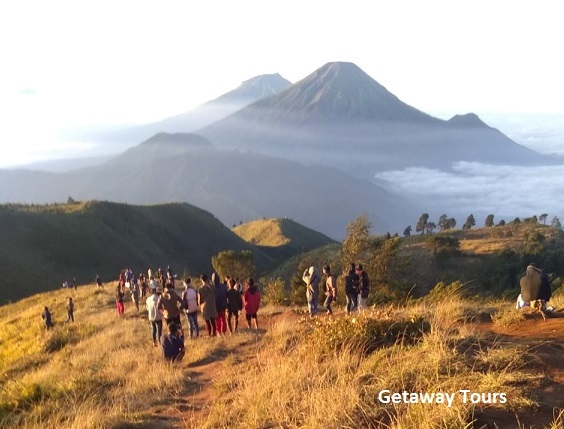 First you will be visiting: Posong View Point, where you can see magical view of Mount Sumbing from slope of Mount Sindoro, where the view point located. Afterwards drive to Embung Kledung, to see the panorama of Mount Sindoro and Mount Sumbing with the water basin. Visit Anggrunggondok Village, where you can visit Taro Anggro Virgin Mary Cave , a religious garden and then observing the coffee process, if you are lucky you can see the Luwak Coffee bean as well, gathered from wild Luwak poop. Check in hotel. Pick up at 02.00 am and then drive to Pathak Banteng Village and then start hiking to the summit, which takes about 2-3 hours walk in normal pace. Breakfast at the peak and then descend about 1.5-2 hours hours. Drive to Arjuna Temple Complex, a 5 temples, known as the oldest in Java and then proceed to visit: Sikidang Crater, a bubbling crater with sulfuric smell. And then hike about 20 minutes to Batu Pandang View point to view Lake Warna and Lake Pengilon with Mt Sindoro. Visit Lake Menjer, and boating around the lake. Drive back to hotel, check out and drive back to Yogyakarta. ETA Yogyakarta 19.00.